A Web browser-based admin tool that allows you to use command line tools to manage Alibaba Cloud resources. 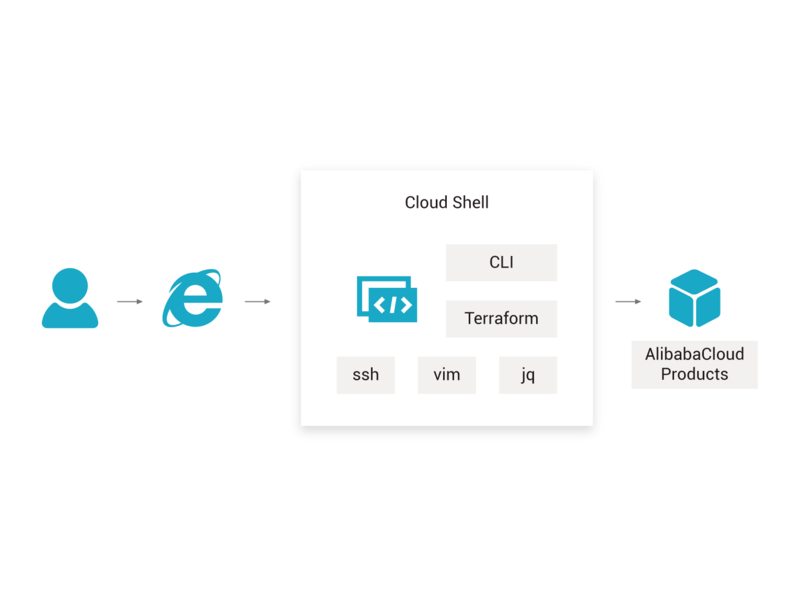 Cloud Shell allows you to manage Alibaba Cloud resources or services from your Web browser. When you start Cloud Shell, an admin machine running Linux is automatically allocated to you. The admin machine is pre-installed with multiple management tools, including CLI and Terraform, and system tools, including SSH, Vim, and jq, to help you complete your daily management and maintenance tasks. You can log in to Cloud Shell to manage cloud resources from your Web browser at any location and at anytime. Cloud Shell allocates a dedicated instance to each user and verifies permissions for each session to ensure the security of access to cloud resources. Cloud Shell is a ready to use service with no pre-requisites. All settings are pre-configured. Cloud Shell is pre-installed with multiple system, management, and development tools for your daily management work needs. Cloud Shell will assign you a virtual machine that runs Linux. This virtual machine is free of charge to use. When Cloud Shell starts up, it automatically allocates a virtual machine instance to you. The instance runs Linux and is active so long as the session is kept alive. You can use the command line tool to connect to the Cloud Shell instance from your Web browser. You can start up Cloud Shell from its console. Cloud Shell can maintain multiple sessions simultaneously and supports login through Web browsers. Cloud Shell provides pre-installed cloud management tools, including CLI and Terraform, and system tools, including SSH, Vim, and jq. The virtual machine is pre-installed with CLI and Terraform to help you manage cloud resources. You can use the CLI to directly call a cloud service API or write a shell script to call multiple APIs. The virtual machine is pre-installed with multiple system tools, such as SSH, Vim, and jq, to simplify script writing and daily management tasks. More system tools will soon be available in Cloud Shell. Instances allocated to users are dedicated and isolated from each other. All resource management actions require identity verification. Cloud Shell allocates a dedicated virtual machine to each account that has logged in. Virtual machines are isolated from each other for security. To ensure access security, Cloud Shell verifies the identity and permission for each action that you have performed. You can use the command line tool to manage cloud resources. With Cloud Shell, you can run commands to manage the Alibaba Cloud resources or services that you have purchased. You can also use shell scripts to schedule operation executions. It enables you to quickly and precisely execute management actions without using any development or maintenance systems. This reduces costs and the chance of human errors. Cloud Shell allows you to use shell scripts to schedule operation executions to achieve quick and precise maintenance. Management tools are pre-installed and automatically authorized. These tools are ready to use after you log in to Cloud Shell. Quickly get started with Cloud Shell. Frequently asked questions and solutions about Cloud Shell usage.